Long lost Canadian superstar Georges St. Pierre will allegedly announce his retirement tomorrow in a press conference. What’s that you say? The dude already retired before? Twice, actually? Yeah, I know. I’m having a hard time accepting this gesture as real, too. Regardless, GSP is still some type of star, so this is apparently newsworthy. Georges St-Pierre, arguably the greatest mixed martial arts fighter of all time, is set to retire, though lightweight champion Khabib Nurmagomedov has made a last-ditch effort to get St-Pierre to reconsider. Sources confirmed to ESPN that St-Pierre will announce his retirement at a news conference in Montreal on Thursday morning. RDS, a French-language sports network in Quebec, first reported that St-Pierre would be retiring. St-Pierre, 37, had hoped to secure a fight against Nurmagomedov later this year, sources said. But as a deal wasn’t materializing, the longtime welterweight champion decided it was time to walk away. UFC is aware of St-Pierre’s decision and is helping to organize the news conference, sources said. The post Georges St. Pierre to Retire… Again… For Real This Time appeared first on Caged Insider. Last night’s mixed martial arts (MMA) action did not end all that well. Not only did Matt Mitrione’s main event clash with Sergei Kharitonov at Bellator 215 end in 15 seconds thanks to an accidental low blow, but Vanessa Porto’s flyweight title fight opposite UFC veteran Pearl Gonzalez at Invicta FC 34 ended early as well due to an accidental eye poke. Despite getting poked in the eye in the fourth round and eventually being ruled unable to continue, Porto still walked away with the technical decision after the action hit the judges’ scorecards. It wasn’t the best way to capture the vacant 125-pound title, but Porto was handily winning the fight up until that point anyways. That’s not the way the human eye is supposed to look, especially the part of Porto’s eyelid that looks like it’s missing a meaty chunk. The puss is just icing on the cake. 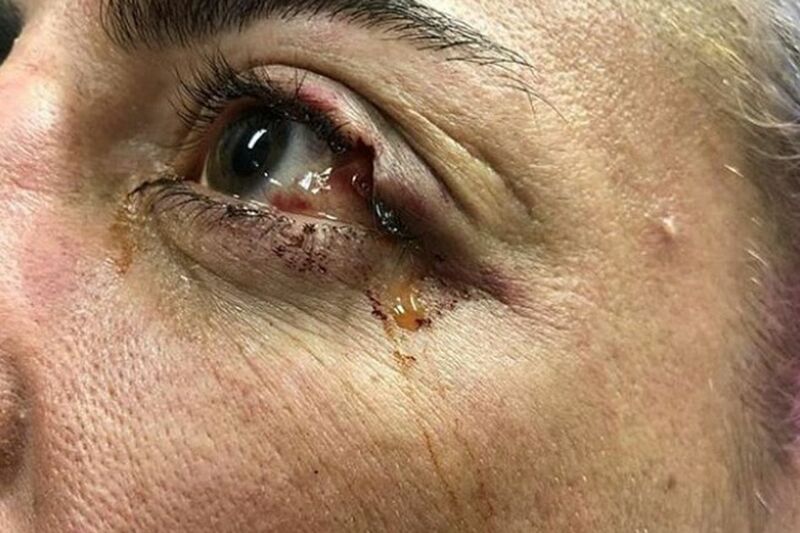 Luckily, Porto didn’t suffer any long-term damage to her eye and will be able to get back into the cage later this year to defend her newly-acquired flyweight title. This was her third shot at Invicta FC gold so she was willing to fight through anything to get that belt. I guess there’s no hard feelings for nearly taking an eye out.